Stand Up Paddleboarding or SUP as it is also known, is an exciting new water sport that is becoming increasingly popular in London and across the UK. SUP is a great way to get on the water and as well as being a fantastic from of fitness, it is also the perfect way to explore cities from the water. Unlike some water sports, it’s easy to learn the basics of SUP and is very safe, so it’s suitable for anyone with a sense of adventure! SUP has been in Paddington since summer 2013, with session’s taking place there most weeks. Active360 will have a permanent base in the basin from June this year, when the take on rental of a converted barge at Paddington Basin to store Paddle boarding equipment from European Land who are developing the Basin. European Land are very keen to see the canal used more and for the Basin to become a hub of social and sporting activity. Active360 will provide beginner classes and coaching session as well as organising SUP Ball games; www.supball.co.uk, SUP Yoga sessions; www.pureyogazone.com and SUP races. The boards will also be available for hire to people with SUP training. 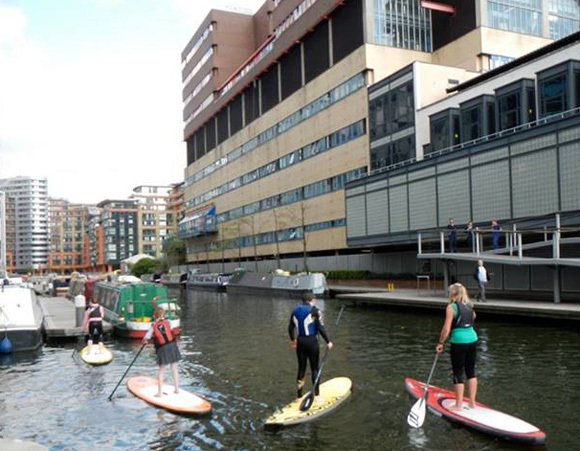 Paddington Basin is a fantastic new location for SUP. The canal provides a safe and environment for water sports and benefits from lively canal-side bars and restaurants as well as being close to Little Venice and only a 45 minute paddle to Regents Park, making it a perfect place to start exploring the canals of London. Active360 are working with the Canal and River Trust to encourage more people use the London canals and to get active! « Thames Festival September 2014 – Celebrating London’s river!